Parmesan Panko Breaded Pork Chops are an ideal meal for easy weeknight entertaining. Breaded with panko breadcrumbs and tangy parmesan they have a crunchy outside crust and juicy tender pork chop inside. 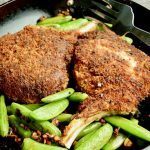 An easy comfort food for weeknight entertaining for having a few friends over or a casual Saturday night evening with family this recipe for Panko Breaded Pork Chops is a meal that you can have on the table in about 30 minutes. 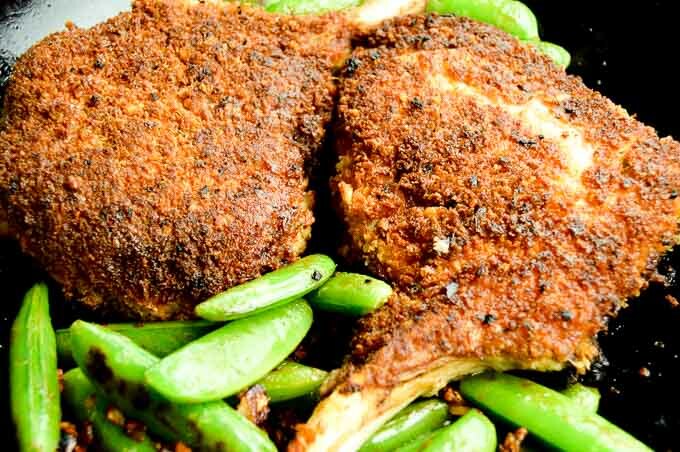 Simple pork chop seasoning fried in a skillet gives a crunchy breaded outside with a succulent pork center. Here in the USA we call this breaded pork chops but it’s actually a variation on Wienerschnitzel that is also a family favorite. But who wouldn’t like crispy coated meat… its like a pork version of fried chicken! The term Wienerschnitzel translated to “Schnitzel fromVienna” (Austria). Viena in Austria is actually referred to as Wien. Although technically if you are calling something a Schnitzel in Austria it is required to be made with Veal and no substitutions. It’s also similar to the Italian version of what they refer to as Milanese which translated to a thin bread coating over meat. Bottom line its’ a true comfort food that your family and company will eat every last bite of. How do you make the best fried pork chops? To ensure that the coating sticks and stays crispy and doesn’t get soggy, rinse the pork chops then pat them dry with a paper towel. This not only helps the flour stick well, but it also makes sure no water is in the coating so it doesn’t pop back at you when frying them. The pork chop seasoning is very simple here. Salt, pepper and little tarragon go along way to flavor the breaded pork chops but what makes this the best pork chop recipe is the addition of the parmesan to the panko breadcrumbs. Combine the panko with the parmesan so its mixed evenly when dipping them. This guarantees that every single bite will have a tangy cheesy crunch. Anyone Ive made this for says its the parmesan panko combo that makes this the best pork chop recipe! Then you’ll set up a dipping station similar to what I have here in this Crispy Southern Fried Chicken recipe. When frying, use a mild olive oil(not extra virgin) or vegetable oil. Both oils get hot enough to crisp the breaded coating but don’t have a super strong flavor that imparts to the pan fried pork chops. Use a cast iron skillet on the stovetop to cook the pork chops. The cast iron heats evenly so the chops are cooked evenly. You could alternatively use an electric skillet for to fry them. The most important thing when getting ready to pan fry pork chops is to make certain the oil is hot enough before adding the meat to the pan. You can test the oil by dropping a small piece of panko crumb into the oil and if it immediately bubbles it is ready. Not waiting until the oil is hot enough will give you a soggy, oily coating. 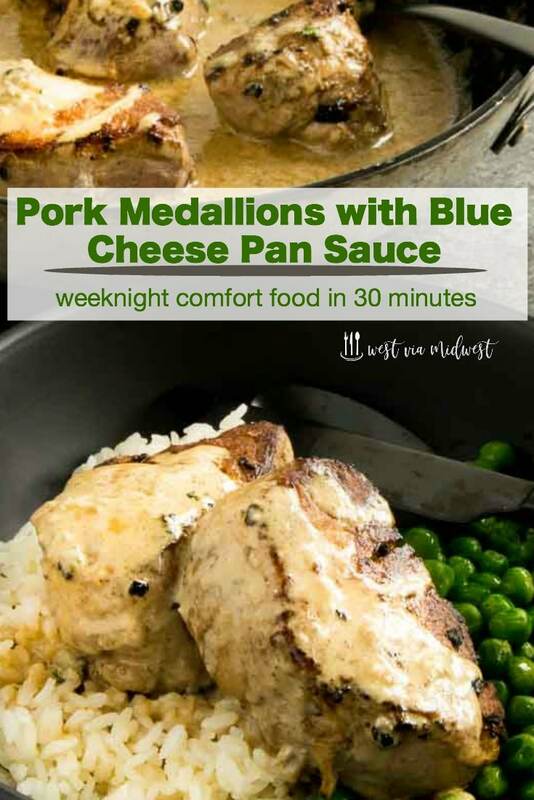 You can also make them in an air fryer — I have a recipe here for air fryer pork chops! This easy pork chop recipe is made with a bone in pork chop for a more upscale presentation. You can sub thin pork chops, chicken or veal that are boneless very easily. If you use a boneless version, you will need to reduce the cook time. You can use a thermometer and cook the meat to its desired doneness or you can do what I do often… I cut into one of the pieces and make sure it is cooked and not raw in the middle. The trickiest part of making this is not making a mess when you are dredging the meat in egg, flour then panko. Food Network has a great example showing you exactly how to do it here. I use one hand only when doing it so one hand stays clean, it will save you time having to wash up in between. I suggest serving a white wine or rose with this pork dish. I am really enjoying these California wines from Talley wines. The Bishops Peak Sauvignon Blanc and the Chardonnay would pair well with this for a casual dinner. 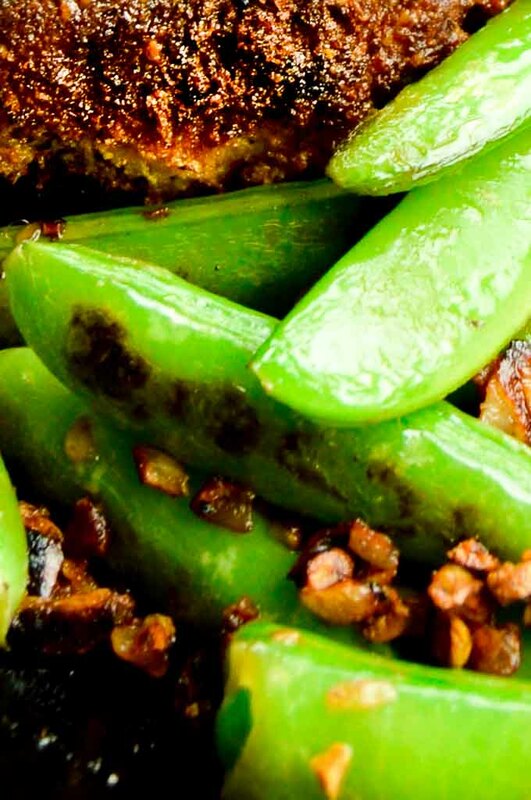 Looking for other side dishes to pair with this easy weeknight meal? Try my Cheesy Rice Stuffed Mushrooms, Hasselback Potatoes Creamy Cauliflower Puree or it would also work with this recipe for Pesto pasta Bites but just serve the pasta as a side dish! Pin this to your Easy Gourmet Dinner Board on Pinterest! Lets Be Friends …. follow me on Pinterest for more ideas for stress free entertaining with confidence! Parmesan Crusted Pork Chops are an ideal meal for easy weeknight entertaining. 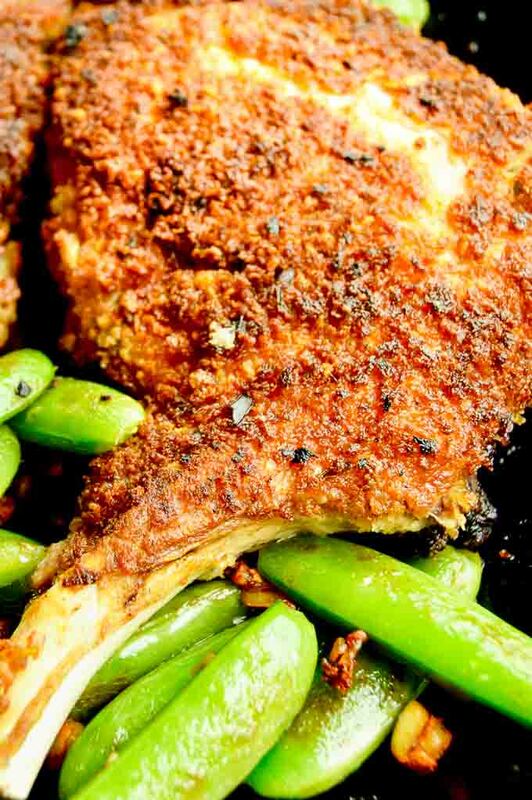 Panko laced with tangy parmesan, crunchy outside crust over succulent tender pork chops. Rinse pork chops, and dry with a paper towel. Then with your hands, or a mallet, pound the pork so that it is about 1/2" thick. Prepare 3 separate bowls for dredging. In one bowl will be the 2 eggs (completely blended.) The second bowl will have the panko, parmesan cheese, Salt, pepper and tarragon(stir to combine.) The third bowl will have the flour. Line up your assembly line. Plate of pork chops(pounded thin), bowl of flour, bowl of eggs, panko, then a clean plate. One at a time, using one hand only, take the pork chop, dip it into the flour, flipping to coat both sides. Then move it to the egg bowl, coating both sides. Then finally dredge it into the panko (both sides) then place the pork chop onto the empty plate. Repeat until all chops are coated. Repeat until all chops are cooked. Serve immediately. What a great recipe for an easy weeknight dinner! I love adding Parmesan to my panko when making Italian dishes so I know it would be fantastic on these pork chops too. Love your tip on keeping one hand clean as I always wind up having to wash my hands a couple times in-between. These were so juicy and delicious! I loved the crust, the flavors were fantastic! The crust on that pork chop is amazing! This is a wonderful dish for entertaining. It looks so fancy yet so easy to make. Pinned so I can make it for company on the weekend. Thank you!! I’m generally not a huge pork chop lover, but these are awesome! Especially with the added parmesan cheese 🙂 Thank you for the awesome tips, too! The panko makes the crust really special, not to mention the Parmesan cheese.